Welcome to FreshBooks! 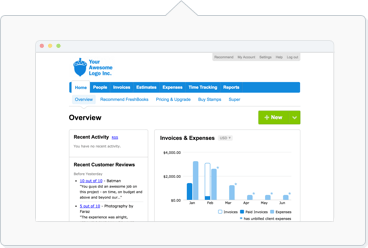 If you're currently running a business or just getting started while pursuing your passion, we're here to help you make accounting painless and easy. Or if you can't make the live webinar session, you can always watch our most recent recorded version here. If you're ready to bill your Clients, you can start making your Invoice with plenty of options to create and customize. You can begin with the steps here. You can get paid faster by accepting online payments with credit cards. In FreshBooks, you have two options to choose from - FreshBooks Payments or Stripe. Click here for all the details. Ready to log some hours you've worked? You can track your time right away with the steps here. From here, you'll be presented with our plans and the features available on each. You can upgrade anytime during your trial with these steps above - just enter your credit card details and save. We won’t charge you or move you to the new plan until after your trial ends 30 days later. This allows you to get all 30 days for free, so you test all the features, and continue uninterrupted after your trial ends.